Leadership and Management course students in the new kitchen. 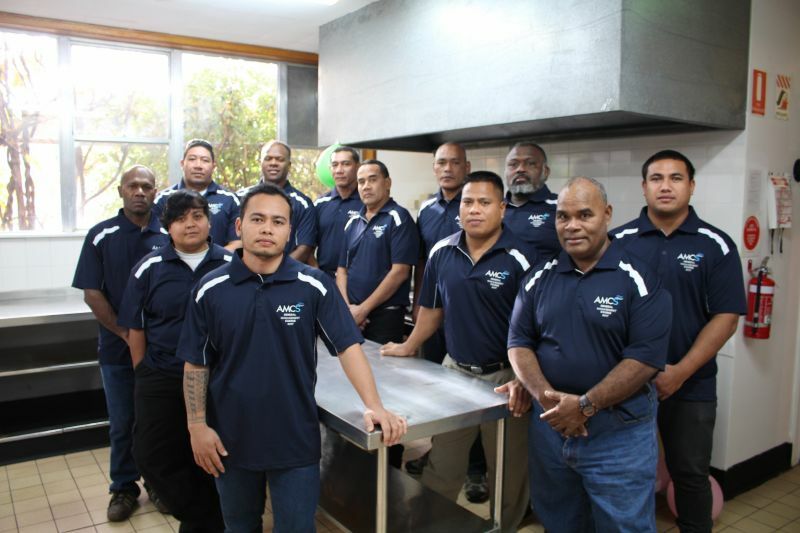 Recent leadership and management course graduates from the South Pacific Islands achieved more than a qualification when they graduated last week: they also unveiled a brand-new training kitchen. As part of their AMC Search course, the 12 trainees took charge of designing and implementing the new kitchen, including planning and budgeting, liaising with local suppliers and even custom-making benches. The kitchen, which will be used by another cohort of Pacific Islander students to train in on-board catering, reflects those on the Pacific Patrol Boats they live and work on — even down to the ovens, which are identical to those found on the vessels. For 25 years AMC Search, the commercial arm of the Australian Maritime College, has been running training for South Pacific Island patrol boat workforces, under contract to the Department of Defence. Around 160 students a year have come to Tasmania to train in all aspects of running the Pacific Patrol Boats —from cook to captain — before heading back to their countries to put their new-found skills into practice. Tevita Waqavakatoga, a Warrant Officer from Fiji, explained that the course had changed his approach to leadership. “When we were given this task, at first it was like a mist: we didn’t know what to do. But as we started, we came to learn. Now, we can’t believe what we have done; we’ve come so far to create this. The course has really helped me a lot, helped me to look deep into how I do things at work. The school has put together an excellent management project, and we wouldn’t be here without them. Chief Engineer Joseph Napa from the Cook Islands explained that the planning stage of the project was the most challenging. Course co-ordinator, Chris White, explained that he felt proud when he saw the finished result. “The kitchen is a great, tangible outcome, and the students get so much out of the project — so much pride and motivation. It’s great to know they will go back to their jobs with more knowledge about how to lead and manage change and implement improvements.